Monthly Committee Meetings are held on the second Tuesday of each month. 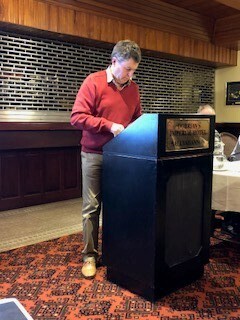 The MED AGM 2019 took place on Tuesday, March 12th at 8.00pm in the Wark Hall, Belleek, Co. Fermanagh. The Keynote Speaker was Mr. John Mullen, from Alternative Energy in Omagh, on the topics “The Benefits of Solar Power Generation & LED Lighting Savings”. MED member Edward Mc Grane also gave an excellent presentation on the function and use of a Slurry Gas Monitor. The MED Rural Development Company AGM for 2018 took place in Dorrian’s Imperial Hotel, Ballyshannon, on Tuesday, March 13th 2018 - (13/03/2018) at 8.00pm. Chairman Jim Brennan welcomed those members attending, together with Liam Maskey from Ballyshannon FabLab and Daragh Turley from FBD Insurance. He then introduced those delivering reports. The annual reports were delivered by, Terry Mc Intyre, (MED accounts) – Brenda Donagher, Network Manager (RES Project) – Jeremy Mc Gonigle, Cattle Committee Chairman (MED Farm Safety Initiative 2017 & MED AI Cattle Improvement Scheme). 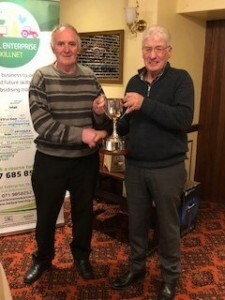 Cattle Committee Chairman Jeremy Mc Gonigle presented the ‘Frank O Kelly Cup’ for 2018 to MED stalwart Jim Brennan. Well known sheep shearing champion and sheep shearing tutor George Graham was the keynote speaker on the subject of ” Farm Safety and Mental Health”. His honesty and frankness about a hitherto taboo subject was refreshing. The interest of the attendance in his presentation was reflected in the number and quality of questions he was asked after the presentation. The meeting then adjourned for refreshments. 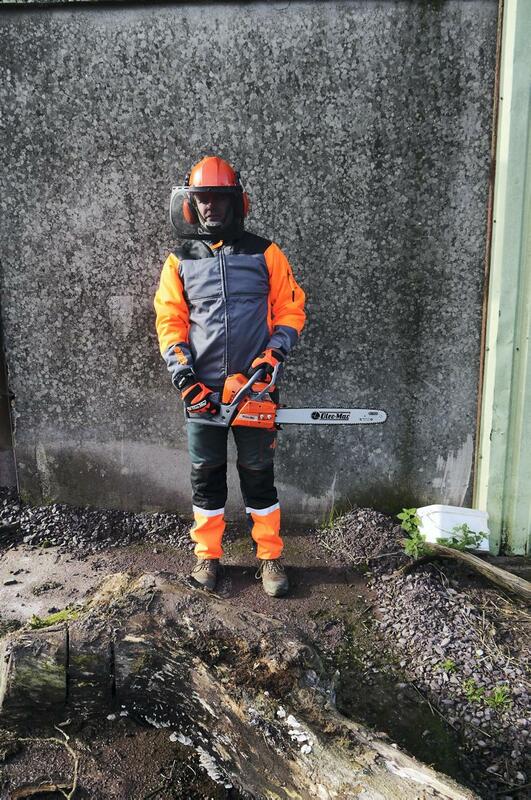 Oleo Mac PPE including helmet, ear-muffs, face-shield, jacket, gloves and trousers. Missing are chainsaw Wellingtons. 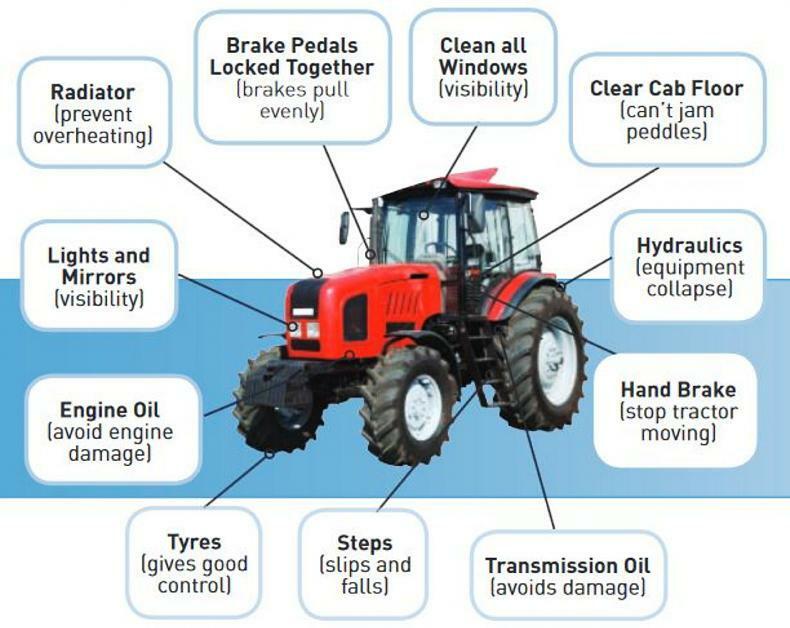 As farming is now regarded as the most dangerous occupation, MED Rural Development Company has decided through a grant initiative, to promote investment in areas where the majority of accidents and fatalities occur on the farm. The MED Rural Development Company AGM for 2017 took place in the Wark Hall, Belleek, Co. Fermanagh on Tuesday, March 14th 2017 – (14/03/2017) at 8.30pm. It was very well attended. Thanks are due to Jean and her team for providing much appreciated refreshments. Thanks are due also to the Wark Hall Committee for their hospitality. The Keynote Speaker was Fergal Hill from Lakeland Veterinary Service who gave an interesting and informative presentation on ‘Calf Nutrition & Health’. Many members had questions for Fergal, and he made great efforts to satisfy all queries. MED members – Please be advised that annual membership fees are now overdue. The MED Rural Development Company AGM 2016 took place in the Breesy Centre, Cashelard, Ballyshannon, Co. Donegal on April 12th 2016 – (12/04/2016) at 8.30pm. There was a good turn out of current MED members, and new members were testimony to the significant benefits of participation in MED Partnership. MED AGM 2015: The MED AGM took place in the Wark Hall, Belleek, Co. Fermanagh on Tuesday, March 10th 2015 at 8.30pm. The MED Annual Autumn Cattle Sale took place at Ballyshannon Mart on Tuesday, October 7th 2014. Formed in 1999 as a cross border, cross community group on the Donegal Fermanagh border. The group initially received small amounts in grants for training the committee and developing a web site. In 2003 the group had a successful two year Peace 11 project enabling a cross border training project. In 2005 we were successful in our application to the Intereg IV A, the project receiving EUR386,000 funding for the Gate to Plate project which was a farm investment linked to education and training in cattle improvement. MED Partnership Group holds their annual weanling sale in Ballyshannon Mart, usually on the first Wednesday evening of October each year. It is expected that over 100 weanlings will be offered for sale under the MED brand at each annual sale. All are AI calves, progeny of the MED AI quality cattle improvement project which has been operational for 10 years. 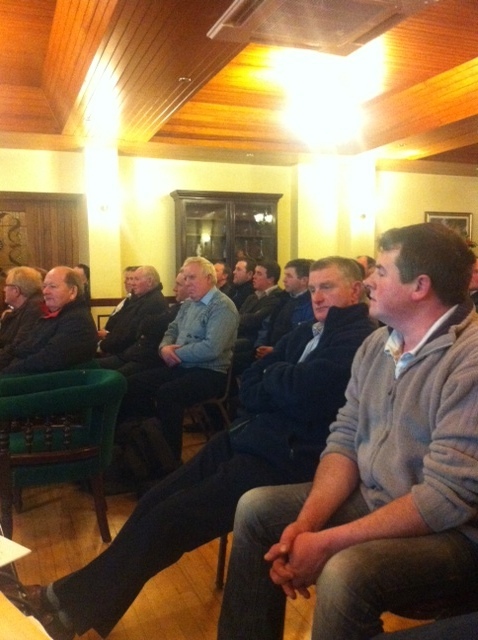 2012 AGM – MED Members listen intently to Nick Garvey , Old Church Veterinary Practice make his presentation on BVD. The 2012 AGM took place on February 7th 2012 in Dorrian’s Imperial Hotel, Main St., Ballyshannon. The MED Partnership Group was formed in 1999 to provide an innovative, creative and sustainable cross community, cross border partnership that will contribute to rural regeneration of the partnership area and respond to the social, economic, educational, environmental and cultural needs of the people living in the area. The MED Partnership Group was formally constituted in 1999 and the group became a company limited by guarantee in 2003. The group is now known as `MED Rural Development Company Ltd´ T/A MED Partnership Group. 2012 AGM – Chairman Pat Johnston presenting the Frank O Kelly Cup, to the person of the year Molly Reynolds, (long serving MED Committee member) for her contribution to the MED Group. The group is managed by a sixteen member committee representative of the geographic area and sub committees manage each project. The management committee has the normal committee officers and the committee meets on the second Tuesday of each month and more often if required. 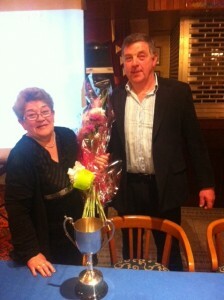 The committee is elected at the AGM each year. We have an equal opportunities policy, a health and safety policy and a financial policy. The committee, from its inception has developed a wide range of skills in managing cross border and internal projects. We aim to develop projects that are inclusive of all people in this cross border rural community, and which will enhance their skills and knowledge providing them with an additional or improved income and a better environment/quality of life. We are a farm based rural community group and many of our members farmed on both sides of the border. We see ourselves as a visionary pro-active group attempting to combat rural exclusion. We liaise and work closely with Teagasc, DARD and Rural Resource Workers from the Partnerships operating in the MED. The name M.E.D. was derived from the three waterways that traverse the area, the Melvin, the Erne and the Duff. The area covers 400 sq miles approximately with a population of 20,000. There are 2080 farms in the area. Most farms are small units 10-20 cow suckler herds and North Leitrim includes hill sheep farms. 1. 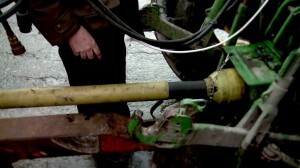 Rural Enterprise Skillnet programme. 2. AI Cattle Improvement Programme: This project aims to improve the overall suckler herd quality by culling and replacement, through retention of the superior female progeny, and providing a linked structured Marketing Program for their offspring and ultimately improving the family farm income. 4. Training and education IT Training/Personal Development/and other skills aim to enhance employment opportunities and improve quality of life for all. This project has purchased a mobile slurry separator funded through RDC and matched funding from the Vaughan Trust. The separator will reduce odors by unto 25%, grass contamination by 25% and will assist farmers in meeting EU directives by improving storage capacity by 25%. These projects are N.I. only and in 2003 MED Partnership Group N.I. 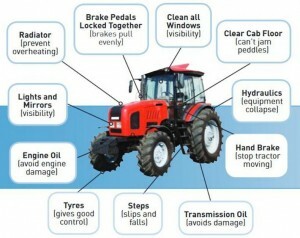 brought a group of 56 farmers together to draw up a farm investment plan and DARD then granted 40% funding towards this. (These improvements are under environment, food safety and hygiene, animal welfare and cattle handling facilities. This 2 year training programme is underway 2003/2005. In Spring 2003 MED Partnership Group received a letter of offer for EUR346,000.00 to implement a skills based training programme under Peace 11 funding. A project manager and administrator were appointed in June 2003 and the programme was In June 2005. Over 600 people have participated in IT programmes, Safe Pass Cert, Wall Tiling, woodland management, Time management and other skills based programmes on a cross border, cross community basis. 8. Web site design and launch. In October 2003 we completed the design and launch of our WEB site. This project received financial support from FAS and the IFI Community Leadership Programme. Several members of our committee completed the IFI community Leadership Programme. The current website was launched on March 1st 2012, after an extensive overhaul. Measure 1.6 and 1.9 are farm facilitation and Farm investment programmes which have been administered by DARD under the Peace 11 programme in N.Ireland. The MED Partnership Group has been directly responsible for implementing these programmes in its geographic area in N.Ireland. a) Improving the quality of cattle on the family farm together with improved animal welfare, good farming practice, health and safety and business competitiveness. b) Providing mentoring to individual farm business to give information, technical advice, support farm programmes in good farming practice, organise and provide education and training. This project is just beginning and will be implemented over the next two years. 11. Other Activities A number of successful activities including computer training, field evenings, and cattle demonstrations displaying quality suckler replacement heifers and weanlings, and a Pilot-breeding project have been initiated.